Free visit, charge-free, during the opening hours. Languages: French / English / German / Italian / Spanish / Japanese / Hungarian / Russian / Elsatian. Guided tours (possible in English): for groups, only with prior booking, depending on availability. Plan a time of around a week minimum. 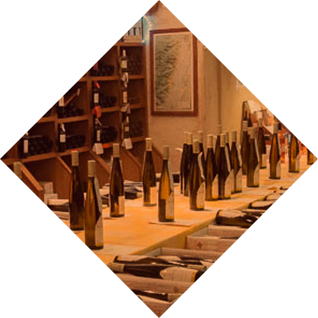 Tasting possible only during the special days of open doors (“portes-ouvertes”). The Cellar is accessible by wheelchairs, pushchairs… through the lift, located left from the stairs, inside the building. In the center of Strasbourg, close from the Place de l’Hôpital, 10 min walk from the Cathedral. The cellar is located inside the compound of the Civil Hospital, downtown side, in the basement of the 18th century building of the General Directorate (administrative services). On foot, follow the Porte de l’Hôpital street to the south. After the hospital gate, turn right to take the Economat gate. The entrance staircase is 50 m on the right, just behind the median; and the elevator entrance is behind the building door just off the stairs. By car, enter the hospital via the Louis Pasteur wharf. Turn right at the roundabout just past the gate, then go straight to the end of the hospital, and turn left. You are in front of the cellar! The entry is reported. The first half hour of parking is free. On foot, pass the door Place de l’Hôpital; access to the cellar just to your left, through the half-moon shaped wooden door.